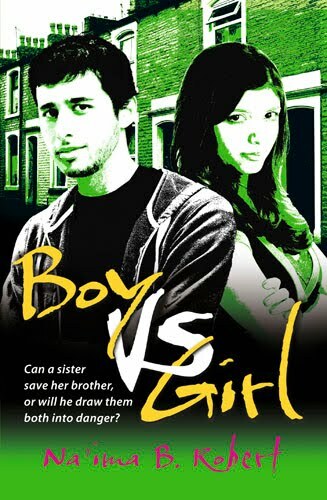 Boy vs girl is a story of a twin brother and sister, Faraz and Farhana written by a very talented sister Na'ima B. Robert. I was eager to get hold of the book as soon as possible and alhamdulillah I loved reading it. I think it's a must for every teenager and their parents and anybody who is interested in helping the young Muslims to be better in deen and dunya, insha-Allah. It can also be read in educational institutions and youth book clubs to discuss the issues it raises, in details. The author has mentioned briefly the common issues our youth have to face on a daily basis i.e. peer pressure, lack of communication and understanding between parents and teenagers, identity crisis, lack of Muslim role models, racism, prejudice, cultural baggage, ignorance of the faith etc. The close relationship between the brother and sister is really beautiful mashallah. Thinking about my own kids, I make dua to Allah swt to bless my children with that sort of a relationship insha-Allah. I lost my brother when he was three and a half and this story reminded me of my sweet brother who was always very close to me. Farhana and Faraz want to be better Muslims. They want to implement the Islamic regulations in their day-to-day lives. However, due to the societal pressure around them, they are struggling to reach to their destination. Even families and relatives can be a big obstacle in getting closer to Allah swt. Needless to say, how damaging peer pressure can be! One of the inspiring role models in the story is auntie Najma, a university educated, niqabi sister who is aware of her rights and responsibilities and trying to live her life according to Allah swt's guidance. She is very independent-minded but at the same time behaves wisely around the relatives who are following their age-old culture and deluded in thinking that this culture is based on Islam. I know how it feels to be in that sort of situation when you are trying to follow the Qur'an and the sunnah but most of the people in the community think that you are just a rebel and trying to deny your so called 'glorious heritage'. Auntie Naj is also aware of what the youth are going through on a day-to-day basis unlike the most Muslim adults. That’s why the kids felt that they can talk to their auntie without being judged or ridiculed. Unfortunately they couldn’t do the same with their parents which again is a very common scenario in our community. Na'ima has also mentioned the hypocrisy among the community. Unfortunately lots of Muslim youths are engaged in drugs, gangs and girls/boys and so forth and in most cases, the families do not even have a clue of what their children are up to. We need to understand that for the youth it's not easy either living in a society where some values and norms are very contradictory to our faith. And to make the matter worse, most of the Muslim parents are leading a life based on their respective cultures and traditions, and not the real Islam. This leaves the youth confused and creates an identity crisis. As the young generation of Muslims in the West, how do we define ourselves? Are we Pakistanis, Bangladeshis, Somalis or just British? Or are we just Muslims who are happen to be here? These are not easy questions to answer. Our youth desperately need our understanding and support. As parents we need to be aware of all the problems they are going through and help them without the judgemental attitude we seem to have. Lots of adults also show rather an apologetic attitude thinking if they say too many (!) positive things about their faith they may get chucked out from this country. It just proves that deep down we are still a community of economic migrants and unfortunately we still haven’t moved on. The other characters in the story are quite interesting too. These characters are quite common in our societies. For example, Shazia comes from a religious family and is expected to wear hijab but she lacks the conviction. Although she knows that her dad is right, she is not that convinced that she needs to wear it as she thinks she is ugly! Once again it reminds me of the lack of confidence and self-esteem among young girls. Even lots of hijabi girls suffer from low confidence in their appearance and hence, we see so many of them wearing so much make-up and jewellery with their eye-catching, figure-hugging hijab to compensate! Sometimes I feel so annoyed looking at these girls, thinking what’s the point of wearing hijab, when everything else that they are wearing is in contradiction to the cloth on their head??? Being super skinny or leading a lifestyle to reach size zero is another scary trend on increase even in Muslim community! Let’s admit it; we are part of this society and the changes in this society will affect us too. We are not living in a cocoon, which some of our parents can afford to live in but we cannot. Guys like Skrooz (whose real name is Khalid) is another interesting character which I bet can be found quite a lot in our society. They enjoy bullying and terrorising people and that’s how they find satisfaction and a sense of achievement?! He shows resentment towards the bad things in the society but at the same time he does not show any remorse committing crimes. He spends time with 'gora' (white) girls but makes sure his sister doesn’t get involved in any relationship as he believes that will damage the ‘honour’ of his family! He even dreams of marrying a decent girl to start a family! There are so many poor girls from the Indian sub-continent who unfortunately get married to this sort of messed up boys with the ‘blessing’ of their parents and lead a life of hell for the rest of their lives! I can’t help but blame the parents who are stupid enough to think that a girl from another society (who is completely unaware of this future husband’s past) can change the life of their bad son when they couldn’t do it themselves! Overall, this is a very good book to read. I am sure you will enjoy reading this book, insha-Allah. I hope Na’ima writes more books insha-Allah. We really need writers like her to help the community to raise a good generation of Muslims, insha-Allah. I am a big fan of her magazine ‘SISTERS’ mashallah. Her book ‘From my sister’s lips’ is another great book mashallah which I loved reading. Hopefully I would like to do a review of the book in future insha-Allah. Jazakillah khayran for the detailed review. I have been on the lookout for quality Islamic literature... I think this will make a good `Eid present in shaa Allah. I hope you will have a fulfilling Ramadan in shaa Allah. I am glad you liked it. May Allah swt bless you and your family with a fulfilling Ramadan too insha-Allah. Take care sis, wassalam. I loved this review and particular the wider refernces to community issues you raise. I didn't think of it, but I agree, this would make a nice gift for my teenage cousin insh'Allah. Very good review. I did not read the book yet, but inshallah I will. I am glad to know that at least there is a writer who understands how difficult it is for kids when there is a cultural and generation gap between them and their parents. It is actually a big trial from Allah for kids I think. I can give you an example here. I have a vary traditional mother, who loves me most in this world for sure and I love her too, but she harbors very traditional thinking. Those things sometimes seem very funny. Like she still feels that she will choose a girl for me and I will think that the girl she has chosen for me is a hur from Jannah. Personally, I have never dated or have been with girls, because my mom raised me very religious since my childhood. Now, I do not mind arrange marriage, but I know that if I turn down the girl my mom choose for me, she will not say anything outside, but will feel deeply hurt inside. She always give me examples how her father and uncles married according to the choices of her grandfather and grandmother. I cannot talk much either, I am too afraid that I will insult my mom plus I am too shy.